Pune is one of the greatest cities in our country being an important IT hub. But apart from that, it is also well known for its night life, street shopping destination and the cultural mix over there. Nothing about Pune is mediocre. And this year it is our favourite destination for the New Year’s party. When it comes to New Year’s celebration, we all have plans made months ago. We start checking for events or booking tickets for a beautiful vacation. But sadly some of us have to be working on the New Year’s Eve. New Year camping party- if you are not one of those who just go to the club and drink their way to New Year’s then this shall get you interested. The New Year camping party is a complete package for the party lovers because this party has a lot to offer to you folks. You can enjoy tent stay, DJ music, bonfire, games and barbeque. What could be more fascinating than this? Wilderness camping & New Year celebration @camp hideout- we bring for you another event that is all about camping and partying. Enter the New Years with new hopes and aspirations. Sleep under the starry sky, breathe some fresh air and welcome the New Year’s. Hard Rock Cafe- everyone is a fan of the hard rock cafe and so are we! 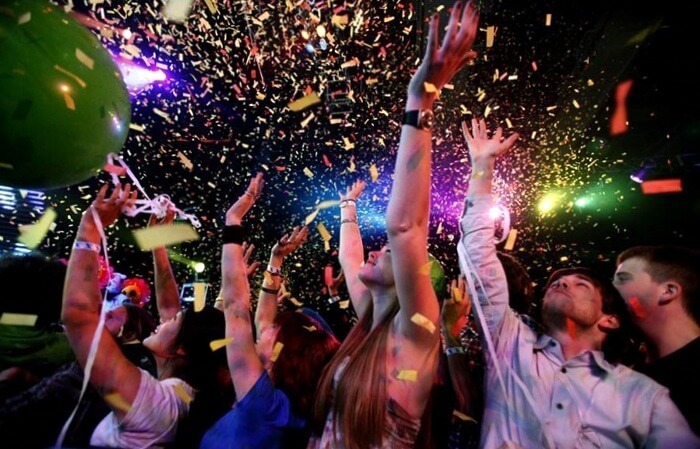 If your idea of party is live band shows, all night dancing, themed parties and amazing food and drinks, then Hard Rock is the place to be this New Years. The Flying Saucer Sky Bar- apart from being one of the most famous and popular pubs in Pune, the Flying Saucer Sky Bar is also famous for its magnificent view point! The rooftop bar gives you a breathtaking view. Along with that you are accompanied by some of the best drinks and tasty food. Not forgetting the music which is a total crowd puller. You cannot just sit and listen to it. The music will make you want to move. Penthouse- again another party famous place that is situated on the 13th and the 14th floor of a commercial building. This place is known for throwing some of the most amazing bash. So, you can imagine what they would have planned for this New Year’s party. Come to this place and you will not be sorry. Apart from the view they offer, they also serve the most mind blowing drinks. So, this new years if you are in Pune, you know exactly where to go for an amazing goodbye to 2K17 and welcome 2K18.